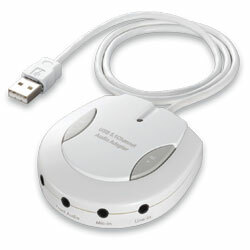 The USB 5.1 Channel Audio Adapter that provides an amazing audio accessory for any computer with a USB port. It is quipped with standard input and output connectors to add a great stereo input and output performance. 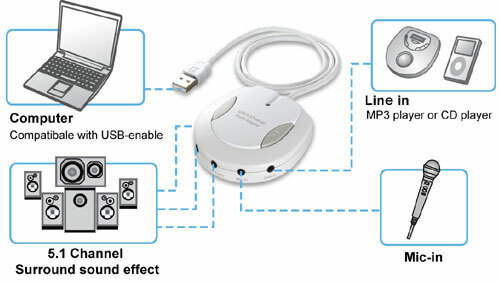 The USB 5.1 Channel Audio Adapter not only combines high quality audio recording and playback capabilities but also allows the connection of most popular audio gear such as microphones, home stereos, musical instruments, and powered speakers to your USB capable computer. Extra unique driver supports Xear 3DTM, makes your games sound better than ever! With fantasy magic voice and karaoke function makes you karaoke party with much joyful and fun. You can also have room size chose and environment sound effect to change the atmosphere. Easily adds stereo 5.1 Channel sound effects to your computers with simply install plug-and-play operation for PC and Mac. * The extra unique driver supports for Windows XP and Vista OS only, and need to installation when used it. Plug-and-play operation, no drive needed. USB 2.0 full speed compliant.